Riviera Beach, Fla. (May 2, 2018) – Housing Trust Group (HTG), one of the nation’s most prolific developers of affordable housing, closed on financing for Heron Estates, a new 101-unit, $24 million affordable housing community for seniors in the City of Riviera Beach, located in northern Palm Beach County, Florida. Construction has already begun and delivery is expected in 2019. A partnership between Housing Trust Group and the Riviera Beach Housing Authority, Heron Estates will provide one- and two-bedroom apartments to senior (55 plus) renter households earning at or below 60% of area median income. Rents will range from $344 to $859 per month. 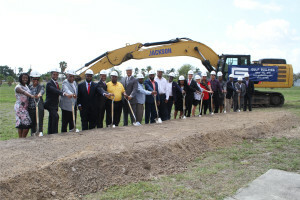 An official groundbreaking ceremony was held yesterday at the property, located at 2003 W 17th Court, Riviera Beach. In attendance were: Matthew Rieger, President and CEO of Housing Trust Group; Thomas A. Masters, Mayor of Riviera Beach; Karen Hoskins, interim city manager, and Danny Jones, former interim city manager, City of Riviera Beach; Bobby Powell, Florida Senator District 30; officers of Al Jacquet, Florida Representative, District 88; Mack Bernard, PBC Commissioner, District 7; Dan Liftman, of U.S. Rep. Alcee Hasting’ office; Carlos Serrano, Palm Beach County Department of Economic Sustainability, Malachi Knowles of the Riviera Beach CRA and Development Council, and Ron Davis, President, Mosnar Group LLC. From the Riviera Beach Housing Authority: John W. Hurt, Executive Director; Delvin M. Thomas, Board Chairman; Jeff Jackson, Vice Chairman; J. Jerome Taylor, former board chairman; Matthew Russell, board attorney; Commissioners Horace Towns and Jessica Thurmond; and Margaret Shepherd, longtime tenant. From the City of Riviera Beach Council: Lynn Hubbard (District 1), Tonya Davis Johnson (District 3); Dr. Julie Botel (District 4); and Terence “T.D.” Davis (District 5). Heron Estates is being financed with 4% Non-Competitive Housing Credits and a $5.7 million SAIL and ELI loan from Florida Housing Finance Corporation; $12 million of multifamily housing tax exempt bonds from the Palm Beach County Housing Finance Authority, which were purchased by JP Morgan Chase to help finance the costs of land acquisition and construction; $10 million of housing credit equity from City Real Estate Advisors (CREA); a $115,000 SHIP loan from the Palm Beach County Department of Economic Sustainability; and a $1 million loan for construction and permanent financing from the Riviera Beach Housing Authority. Heron Estates will be a garden-style, three-story property with 101 affordable apartments and amenities including a swimming pool, multipurpose community room, state-of-the-art fitness center and WiFi enabled computer center. Residents will have access on-site to free computer training, daily activities and assistance with light housekeeping, grocery shopping and laundry. The development team consists of the architect David Lawrence Architecture, Wantman Group, Inc. as engineer, and Gulf Building, LLC as general contractor. The development will generate over 125 temporary jobs and at least four permanent jobs. HTG more recently completed an extensive renovation of Covenant Villas, an affordable community for families located in the City of Belle Glade, Palm Beach County and recently broke ground on another senior housing development, Douglas Gardens V, in partnership with Miami Jewish Health Systems, in Pembroke Pines, Broward County. HTG has also developed the award-winning Courtside Apartments in historic Overtown neighborhood of Downtown Miami and has two other affordable communities under construction: Princeton Park, in southern Miami-Dade County on US Highway 1, and Arbor View, a mid-rise 110-unit senior community in the City of Margate, Broward County.